Juxtaposing traditional values with the willingness to experiment, the approach to whisky making embraced by Bruichladdich Distillery is one which the entire Scotch Whisky industry could learn for. Under the stewardship of Whyte & Mackay, the distillery was neglected during the 1980s and 1990s, before being bought over by Murray McDavid in 2000. With the help of former Bowmore manager Jim McEwan, the distillery was entirely renovated, with production recommencing in July 2001. Since then, its independent nature has allowed it to forge its own path. Bruichladdich proudly embraces its non-conformity, labelling themselves as “Progressive Hebridean Distillers”. This is reflected in its output, which ranges from the unpeated (Bruichladdich), to the peated (Port Charlotte) and super peated (Octomore), alongside The Botanist Gin. All are an indication of a distillery which wants to make the best whisky possible, rather than tying itself to a definitive expression or bottling. Although It was sold to Rémy Cointreau in 2012, the distillery has been allowed to maintain – if not strengthen – its unique identity. The Classic Laddie is the distillery’s signature bottling and it proudly claims to use 100% Scottish barley. As is increasingly the trend, the bottling doesn’t come with an age statement, which allows Jim McEwan and his team to bring together whiskies of different ages to produce the best quality spirit possible. This – along with the tall and narrow stills – helps to create a whisky which is light, elegant and floral. The nose is both smooth and zingy, with sweet honey giving way to a lemony freshness. This mixture continues on the palate, and is complemented by an oaty, biscuity flavour. The finish has a slight hint of spice and mint but also maintains a maritime freshness. 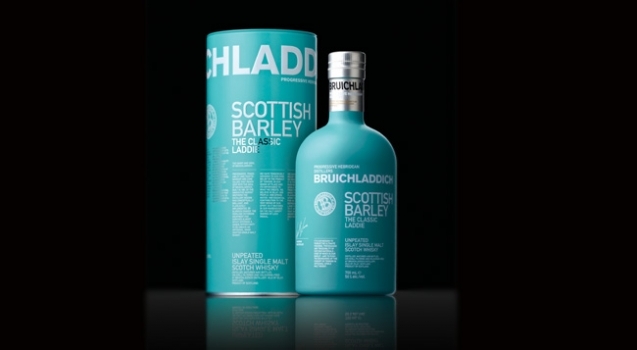 The Bruichladdich Classic Laddie gets top marks from me. Please, continue to innovate, lead and forge a path for the rest of the Scotch Whisky industry to follow. Excellent blog Craig, tried a few from Bruichladdich distillery in past and maybe treat myself to this one, always had a taste for the Islay malts. I still don’t like the bottle design, I am afraid. Why hide the colour of the whisky?